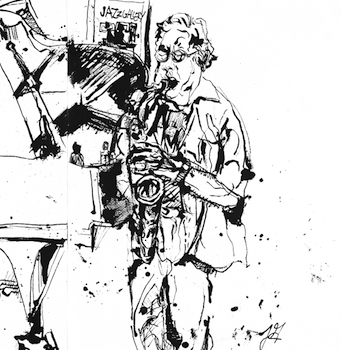 This website is dedicated to my art, with a focus on jazz and portraiture. 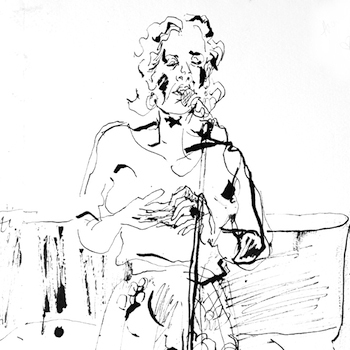 I hope that by looking at my drawings you get a feeling for each performance in real time. 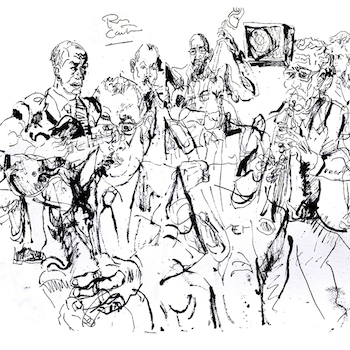 I consider it a blessing to have heard some of the greatest musicians of Blues, Jazz, Classical, Folk and Rock. The improvisational nature of my art takes its lead from the music. Influenced by the likes of Rembrandt, Claude Lorrain, George Grosz, Rico Lebrun, David Stone Martin, Alice Neel, Romare Bearden and Archibald Motley among others, my art works best when trusting my intuition and combining my love of art with my love of music. Music has many intangibles and abstractions that can enlighten. My art grapples with the ephemeral experience and living within the moment of its creation. While streaming music may have the advantage of accessibility, it is nothing compared to the experience of the live performance. 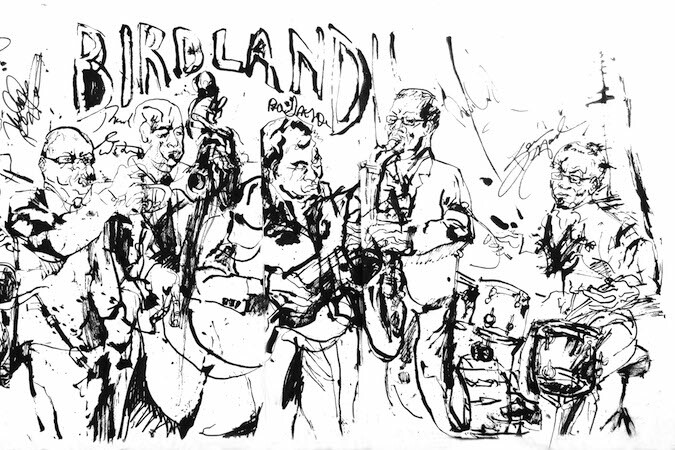 As the late Dale Fitzgerald, great mentor and one of the founders of the Jazz Gallery once said, “Jazz is forever”! I hope and pray that live music will continue to be supported by future generations. 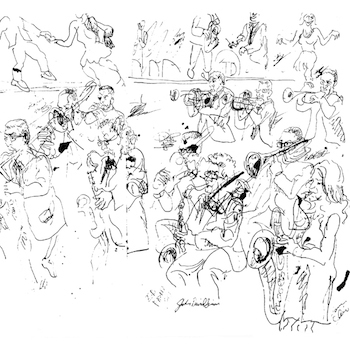 I began to journal my experiences at the suggestion of my college professor and mentor, famed illustrator Alan E. Cober by carrying a sketchbook wherever I went. During this period, I spent a great deal of time drawing the elderly population in an old age home, while learning from my subjects about their lives and their daily existence as they endured the trials and tribulations of the aging process. 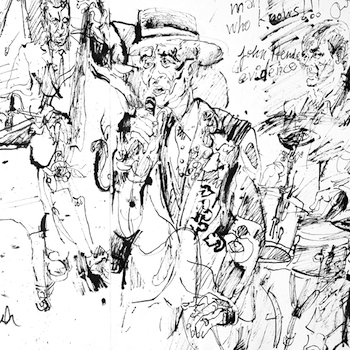 The insight I gained has been the psychological foundation for my drawings and watercolors, similar to the strength and fragility I strive for in my jazz sketches. My college days were filled with highs and lows, culminating in a diagnosis of clinical depression shortly after graduation. After graduation, chronic depression escalated to the point where I could no longer immerse myself in my art. With therapy and treatment I emerged with a strong sense of self, and my art flourished. I was encouraged by an art therapist at “Post Graduate”, a treatment center for mental health, to nurture my creativity through my artwork. I joined Fountain House, and received encouragement through productivity and a strong support system. 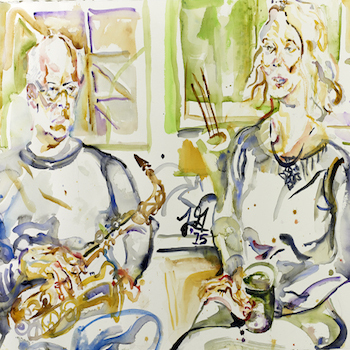 As a member of Fountain House and Fountain Gallery, I have shown my work in one man and group shows as well as in Jazz venues around New York City. My love of Jazz developed after discovering the confident phrasing of Charlie Parker and other Jazz greats of his time. 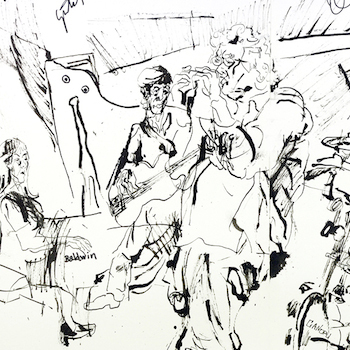 I was fortunate enough to attend performances of some of the great musicians and my pen and ink drawings of live performance became part of my existence. I found Jazz to be therapeutic during this very tumultuous period in my life. 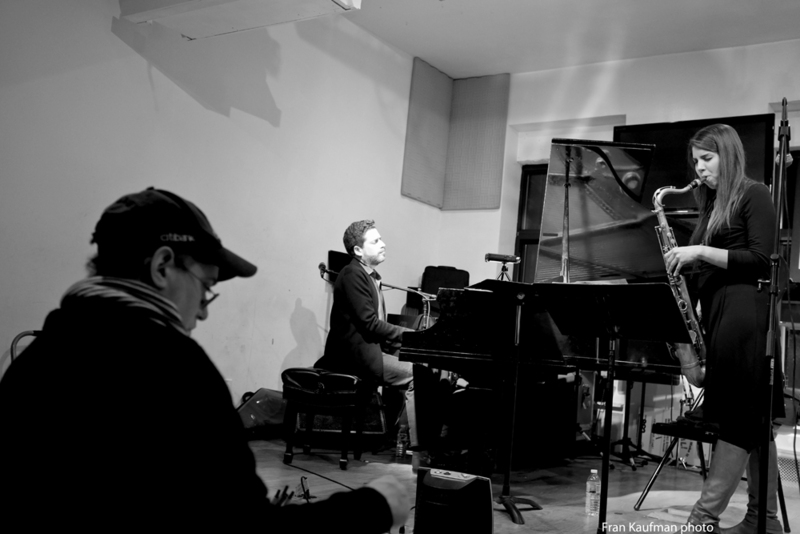 I tried to absorb lessons from Phil Schaap, as he imparted a deep respect for the history of Jazz. Through the ups and downs of my recovery, I was encouraged by the Jazz community to continue my work. 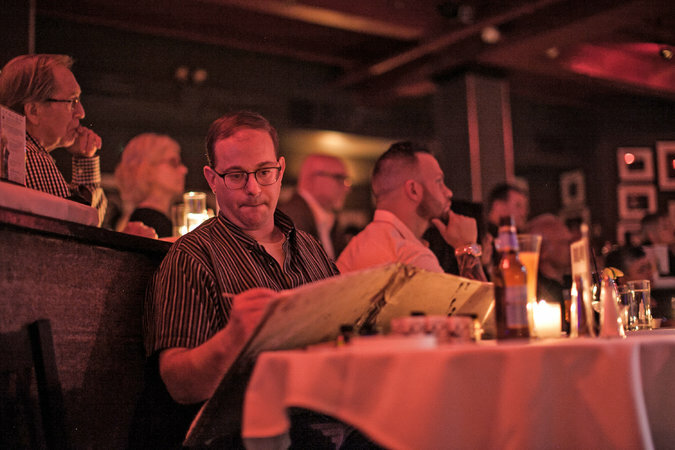 New York Jazz clubs like Jazz Gallery, Jazz Standard, Zinc Bar provided a safe environment to draw in an intimate setting. My acceptance by the musicians and club owners is most gratifying, and I have established lasting friendships with many of today’s Jazz notables. 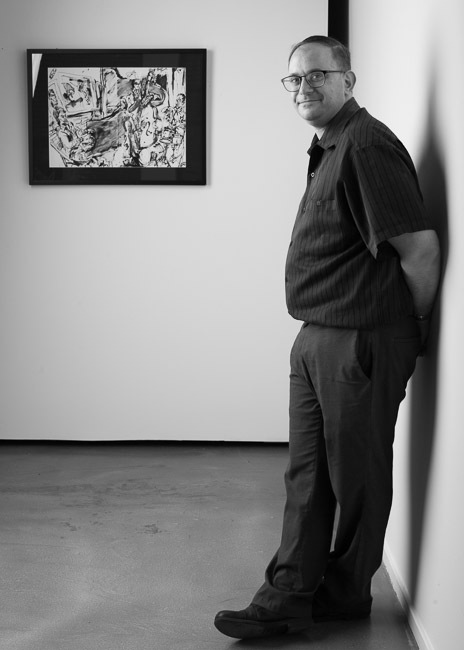 "Jonathan Glass is the real deal, an artist who gives his all to the purpose of realizing his deeply personal vision. In the nearly ten years that I’ve known him, I’ve admired his tenacity, openness to improvisational risk-taking, and above all, the vibrant, one-of-a-kind results." The studio project is dedicated to my love of portraiture. My work is influenced by such artists as Lucian Freud and Alice Neel. 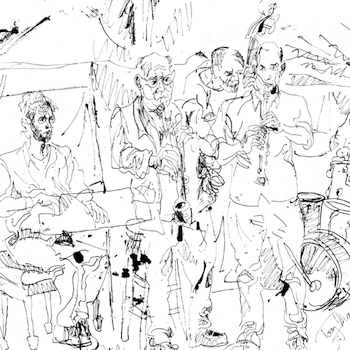 Since I don’t have enough space to paint in clubs, my studio affords me the opportunity to depict music and its makers using watercolors in a comfortable setting. If you are interested in sitting for me, please contact me through the “contact” page. We will arrange a mutual time for you to come to my studio, talk about our visions for this project, agree on a price and schedule a time that works for both of us. I usually need three sessions, each about three hours in length. If you are unable to get to my studio due to impairment, I will be happy to come to you, provided that you pay for traveling expenses for myself and my equipment (lighting, drop cloths, etc.). Once we have made the decision to go forward with this project, you will have my full attention and commitment to satisfy you with the results. I will ask only for your commitment, your willingness to converse about things that may help to reveal your personality so that I can accurately portray you on canvas, and an ability to sit for a period of time in a relaxed fashion.